We made the switch at 35 weeks. Some may think changing care providers (OBGYN/doctor/midwife) and hospitals so late in the pregnancy game can’t be done, or might be too much of a hassle. To be quite honest, we feel so much more peace right now for doing so. See, two things happened. One — back in September we began taking the Bradley Method childbirth classes. We just finished our last class yesterday. Can I say, amazing? We loved it, not to mention that we had a fabulous teacher whose only concern was that we became informed and educated about the birthing process. The class really made us more aware of what goes on in a hospital when it comes to birthing a child. I told Greg that I wish I never knew what I learned during that class (“ignorance is bliss”), because then I could have just given birth at any hospital. But now that I know, there’s no way I can go back to not knowing. And two, at 35 weeks of pregnancy, we finally took the tour of the hospital we would be birthing at. I really should have thought about taking the tour sooner, but it didn’t occur to me that I would not like a hospital that much. It probably had something to do with this being the birth of our baby and all, but I was just not feeling the whole vibe going on in the Labor + Delivery ward. And that’s exactly how it felt — “a ward.” The nurse seemed right out of a tv show or movie — repeating everything she had memorized about her ward. I remember being the only one to really ask any questions about their procedures. Everyone else just followed her. Greg encouraged me to give it to God. When we got home, I spent time in prayer because I knew the only way I could get peace about the situation was by giving it to Jesus. I laid out my options before Him, and told Him to choose. 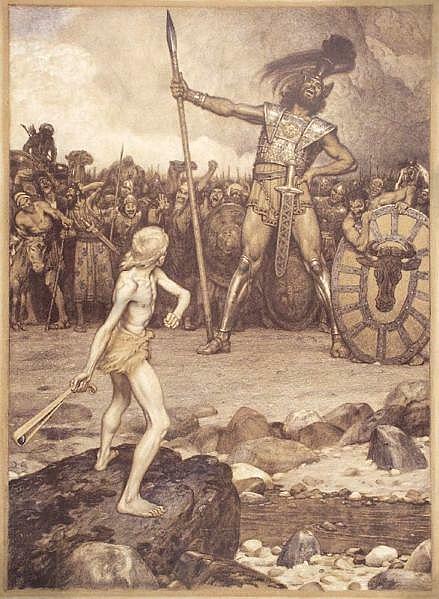 In my daily bible reading for that day, I was reading the book of 1 Samuel 17:45-47 — the story of David + Goliath. My little issue of health care providers and hospitals is nothing compared to David taking down Goliath, but God really spoke to me that day that no battle is too difficult for the God of Israel. He thinks no problem too small. His only desire is that we ask Him and believe that He is a rewarder of those who seek Him. In faith, I prayed and called another midwife practice I had heard great things about. So at 35 weeks, we switched over to a small midwife practice and hospital in downtown Baltimore. The midwife practice fit me into their schedule the same day. My appointment was at 6:45 PM, but due to rain and traffic, I only got there at 7:15 PM. Kathy Slone, midwife and owner of the practice, was there to meet me, talk to me for an hour about anything and everything, and walk me out afterwards. (I just love the fact that she looks like Ina May Gaskin!) The midwives are caring and really into the whole natural process. The hospital we moved to believes in creating a natural atmosphere for father, mother and child. I feel so much more at home now. There are 2 things I would advise any soon-to-be parents. One, make sure you are happy and comfortable with your care provider, whether it be a doctor or midwife. Two, take the hospital or birthing center tour! And three, just for kicks, take a Bradley class! It will change your view of having babies! thats why, God willing there is a next time, I’m totally homebirthing it all the way. yay for midwives! Good for you. I’m biased and feel midwives (for most people) are the best route for a mom. After all statistics point towards them having safer births. But you already know that with all of your reading! 🙂 We have a great birthing center here in OH but there are so few like it! If you can find somewhere that is midwife friendly and who will let you birth like you want then that is a wonderful hospital! I tend to let my body do anything it needs to in order to have a baby. I get loud towards the end and have been told most hospitals won’t stand for that much. My first baby was induced and with an OB. Terrible experience. I won’t go that route again unless we had to for health reasons. It’s very worth it to go the natural route and as one midwife told me, “let go and let God”. How true. Many blessings upon you on the arrival of your first born!